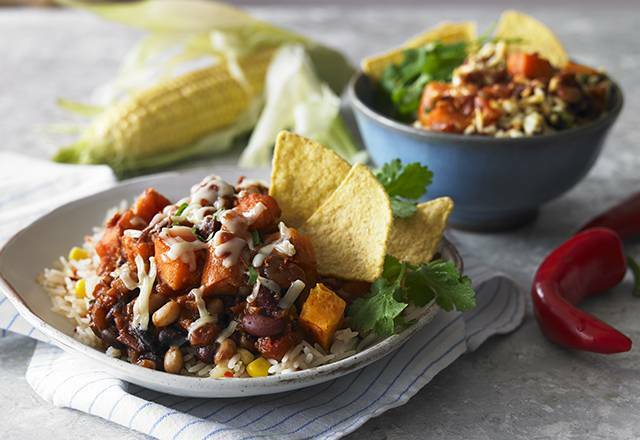 Roasted sweet potato and three-bean chilli, slow cooked in our smoky tomato sauce, topped with crispy tortilla chips and served with Mexican rice. 2. Remove the film but leave the chilli and rice in their wooden trays*. 3. Unfold the foil we’ve provided and tightly wrap over the top of the rice. 4. Place both trays on a baking tray in the centre of the oven and cook for 25 minutes. If using a gas oven, cook for an extra 10 minutes. 5. Leave to stand for 2 minutes and stir well before serving. Make sure they’re piping hot throughout. Water, tomatoes, rice (12%), sweet potato (5%), Cheddar cheese (milk), black-eyed beans (4%), red kidney beans (4%), onions, rapeseed oil, sweetcorn, carrots, black turtle beans (2%), lemon juice, celery, maize flour, salt, mushroom stock (mushroom concentrate salt, dried mushrooms, modified maize starch), cornflour, sunflower oil, red pepper flakes, honey, sugar, tomato puree, chipotle chillies*(smoked chipotle chillies, water, vinegar, sugar, salt, natural flavouring, garlic), spirit vinegar, cocoa powder, garlic puree, parsley, ground cumin, lime zest, paprika, ground coriander, ground cinnamon, chilli powder, cayenne pepper, dried oregano. *As you would expect, this has a bit of a kick. One of the best ways to enjoy chilli is alongside some American brown ale, but if you can’t get hold of some, we recommend going for something Belgian like Leffe.